So how can you join in the fight and spread awareness? What are some of the best ways to show support for someone you know has been affected by breast cancer? Memorable Gifts lists the Top 10 Tips & Gifts for Breast Cancer Awareness! Find out how a personalized gift can make a difference in yours or a loved one’s life today. A touching gift for anyone currently diagnosed with cancer, a survivor or loved one showing support for the cause. 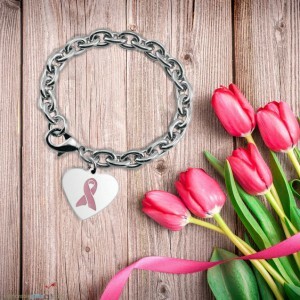 This lovely charm bracelet features a heart-shaped charm with the official Breast Cancer Awareness ribbon within. Customize it with a first name or initials on the back of the heart. The first step in the fight against breast cancer is to raise your own awareness! The American Cancer Society is a great resource that conducts studies examining cancer causes, prevention, and survivorship issues. Learn ways to lower your risk like staying physically active, eating healthy and limiting alcohol intake. Inspire a loved one affected by breast cancer with a heartfelt and hopeful message engraved on this Pink Ribbon Breast Cancer Awareness Frame. Letting them know you are there with them every step of the way creates a wonderful gift worth more than a thousand words. 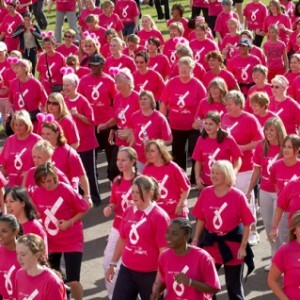 One of the most uplifting ways to spread awareness of Breast Cancer and be part of the solution is to join a walk! There are many occurring all over the country, primarily during the month of October. Making Strides, Susan G. Komen Race for the Cure, and Avon 39’s The Walk to End Breast Cancer are just a few. 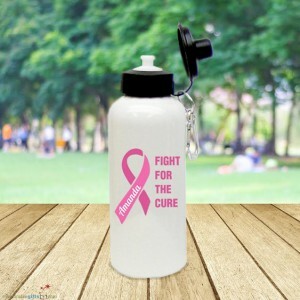 What better gear to take on a breast cancer awareness walk than this Fight for the Cure personalized Water Bottle? This 20 oz. aluminum water bottle includes a convenient snap-on clip perfect to carry along any walk, run, or trip to the gym. Personalize it with yours or a loved one’s name and raise awareness for the cause! Nothing is stronger than the bond shared by family, and few things are more inspiring than to see a loved one stay strong through true adversity. 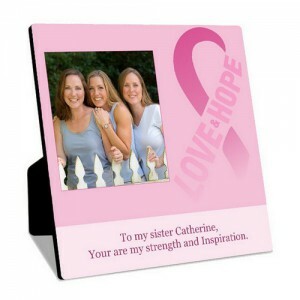 Show them how much they mean to you with this Love-Hope Personalized Photo Panel. Add your personalized 6” x 6” image & heartfelt two-line message. 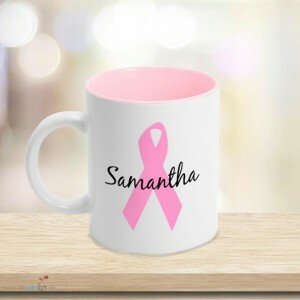 A little coffee or tea and this personalized Pink Ribbon Breast Cancer Mug are sure to warm the heart! Customize it by having your own, or someone else’s name that has been affected by breast cancer, printed across the pink ribbon. Also available is a custom Breast Cancer Survivor Pink Ribbon Mug. 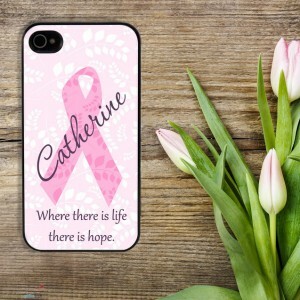 Sharing your support with this Personalized Pink Ribbon Phone Case is about as close as you can get to literally wearing your heart on your sleeve! Cell phones today are carried everywhere, so wherever your loved one goes they’ll be reminded of the love and support you have for them. Spending time with someone who has been affected by breast cancer can be one of the greatest gifts of all. Whether it be a family member, friend, or acquaintance, your time spent hearing their story, cheering them up with your company, and helping out around the house or with any other physical needs will mean the world to them. 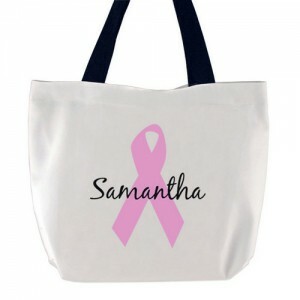 This personalized Pink Ribbon Tote Bag not only makes a great gift, but can also aid in your volunteer time! Use it for grocery shopping or to carry items on an errand as you help someone affected by breast cancer. It’s a great way spread awareness wherever you go. A Breast Cancer Survivor Tote Bag is also available.